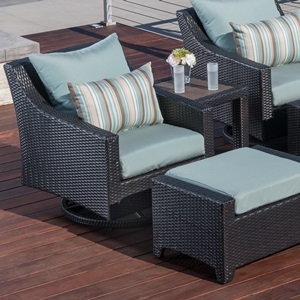 When you bring timeless but contemporary style, superior comfort, and all-weather durability together in a complete outdoor furniture set, you end up with a patio that turns your backyard into the perfect outdoor getaway. 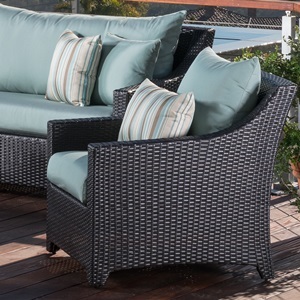 From sharing a conversation, reading a book, or simply enjoying the sun, this deep seating outdoor furniture set can help you sink in, kick back, and let the time slip away. 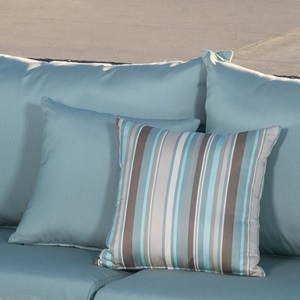 Constructed with extra plush deep seating and a sturdy powder-coated aluminum frame, this might be the last patio furniture you ever need. Set includes a two-piece oversized sofa, two club chairs with matching ottomans, and a woven accent coffee and side table.